In cases when doctors fail to diagnose patients’ medical conditions in a timely manner, the results can have very serious impacts on the lives of patients and their families. Patients and their families must put a lot of trust in doctors and surgeons. Doctors undergo many years of intensive training in order to be able to identify and diagnose conditions and prescribe treatment that will hopefully improve a patient’s quality of life or even save their life. There are some cases when doctors fail to diagnose patients’ medical conditions in a timely manner and the results can have very serious impacts on the lives of patients and their families. In the instances where these negative effects could have been avoided, doctors need to be held responsible for the care that they provide. Not every case where a favorable outcome is not reached actually constitutes malpractice, but discussing your case with a medical malpractice attorney may help you to better understand the laws in Missouri and whether or not you have been the victim of medical malpractice. One medical malpractice case resulted in the plaintiff having a stroke after there was a delay in diagnosing carotid stenosis. The plaintiff was 2-3 hours from his home, away on a business trip. He began to experience lightheadedness, nausea, tingling and numbness in his left arm for a brief period of time, and vertigo while he was staying in his hotel room. The man was alarmed by these symptoms, called 911 and an ambulance came to take him to the emergency room. When he called his doctor’s office and spoke with the receptionist he mentioned the transient ischemic attack (TIA) as he had been instructed to do by the ER doctor and was given an appointment for four days later. But two days before his appointment the man’s wife noticed that he had a facial droop and he began experiencing weakness on his left side. He went to the hospital right away and there he was diagnosed with a right MCA stroke and given a drug that breaks down blood clots. There was more testing down and it showed that there was tissue death in his brain and obstruction of his right carotid artery. When he was discharged from the hospital he needed a cane to help him walk and experienced chronic pain syndrome. The defense contended that because the man had been discharged from the emergency room and he was not kept at the hospital overnight, this showed that his situation was not truly urgent. They claimed that the standard of care had been met by giving the man an appointment within a week. But the plaintiff’s argument was that his ER doctor had told him he needed close follow up care and that the practice had dropped the ball by allowing the receptionist to make decisions regarding the timeliness of his care. This case was settled for $1 million. 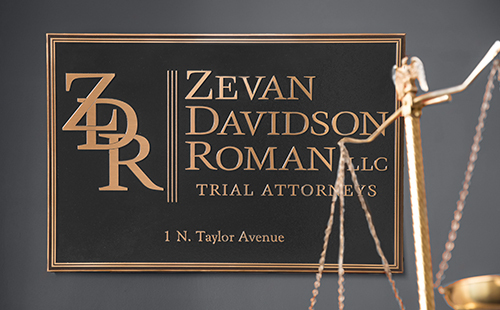 If you or a loved one has received substandard care that resulted in harm in the state of Missouri, the Zevan and Davidson Law Firm can help. We understand that when a medical error has occurred, you and your family need answers. To schedule a free and private consultation, call us today at (314) 588-7200.